We originally specified that Diane should be a Lotus Europa big-valve twin-cam, but we've recently featured a big-valve and found a really nice S2 instead. The S2 Europa used the 1.6 liter Renault engine used in the S1, but offered additional creature comforts, like roll-up windows and adjustable seats. 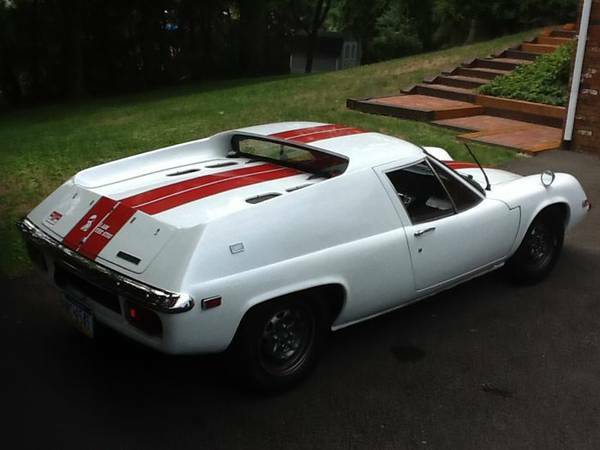 Find this 1970 Lotus Europa S2 for sale in Pittsburg, PA for $14,500 via craigslist. This S2 has had its engine massaged for more power and the seller claims it puts out 120 horsepower, putting the performance on par with a later big-valve Europa. Slap on the extra set of wheels with mounted racing slicks and this 1450 lb featherweight will dance around any cones you can find. If you ever plan on crashing this S2 at the track, someone in the SF Bay area is selling an entire Europa body and frame for $800 on craigslist. I've always thought these were some of the ugliest looking cars...I don't get the design at all.